Visited here on a Monday and encountered friendly service and good beer. Traditional pub interior and a nice beer garden. Nothing not to like about it. Ultimately, not a pub I had any predetermined plan to visit while in Whitstable for the wonderful oyster festival a couple of weekends back, but having left the beach and all its delights behind in the evening and taken a quick bite at a nearby Italian restaurant, I needed to walk myself back to my accommodation, which was conveniently situated at the south end of the main street. A few pub options present themselves on that lively and vibrant route - the Ship Centurion probably being my preference, but I'd already been in the morning - so I walked on having vowed to sample somewhere different. Having rejected the predictable if usually-sound Wetherspoon option, I discovered what appeared to be a traditional, cosy little local, and despite it being a Shepherd Neame house which inevitably narrows the cask beer field, I gave it a chance. 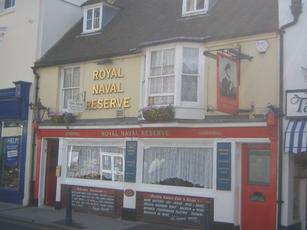 That pub was the Royal Naval Reserve. And by and large, I wasn't too far wrong in my estimation of the venue from its outward appearance. Once indoors one is presented with a traditional, seafaring (well what a novelty in Whitstable) sort of feel, which was small, but its limited floorspace encouraged a hearty intimacy amongst its customers - who numbered many as it was a busy Saturday night and everyone was in festival spirit. Whether it's always that well patronised remains to be seen, but the atmosphere was infectious that night. There were as many ladies as gents in attendance, although arguavly accented towards the 40+ demongraphic. Albeit that youthful vigour might have been lacking, music was playing and everyone was locked in lively conversations, suggesting a good old time was being had by all - an encouraging sign in a local. The service at the small bar area was noteworthy - getting served quite promptly as an unknown face amongst a sea of locals with only one person on the bar was impressive. A well-poured pint of Sheps' was delivered by what I assumed was the landlady - and it was not your run of the mill offering; some sort of stout whose name I forget now without researching, but I do recall it went down a treat. A couple of other more routine SN beers featured for the less-adventurous, alongside the usual raft of mass-produced keg and bottled products for those not converted to cask. I can't pass judgement on food, as it wasn't being served that late on, but from the previous review I'd be tempted to give it a try in future. A very friendly and jolly establishment when busy, and I'd imagine a quiet and cosy haven when it isn't. Maybe not an outstanding pub but certainly not to be dismissed without trying, at least not by the pubgoer who favours tradition and community in their boozers. Hilarious, had a great time. Just had pubs should be (in the 70's).